Philadelphia’s Unbeaten Little Big Men Christian Carto & Manny Folly! Philadelphia had a WBA World Bantamweight champion back in the early 80’s named “Joltin” Jeff Chandler, 33-2-2 (18). In November of 1980 he stopped Julian Solis, 21-0, for the WBA bantamweight title. He was the first American in 30 years to hold the bantamweight title. Chandler won both the USBA & NABF titles and as world champion had nine successful title defenses. He knocked out Solis in a rematch and also stopped Japan’s Eijiro Murata, 18-0-3, having been held to a draw in Japan in their first title encounter. He stopped fellow Philadelphian Johnny “Dancing Machine” Carter, 23-1, who he lost to in his short amateur career. In 1983 he defeated future Hall of Famer Gaby Canizales, 24-1. Later that year he lost a non-title fight to Oscar Muniz, 35-3-3, out of L.A. He would stop Muniz in a title fight before the year was out. In April of 1984 Chandler was stopped and lost his title to Richie Sandoval, 22-0, in which would be his last fight. He would undergo removal of a traumatic cataract from his left eye and retire shortly afterwards. J Russell Peltz was his promoter and is an IBHOF inductee and still promoting in Philadelphia. You would almost think this is an article about Chandler who was inducted into both the World Boxing Hall of Fame and the IBHOF. 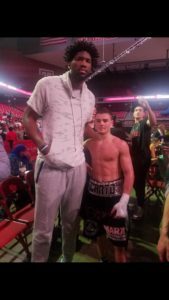 Chandler was introduced into the ring recently on April 29th at the Temple University Liacouras Center where he watch Philadelphia bantamweight Christian Carto, 9-0 (9), score his ninth straight knockout in a row since turning professional. As usual Carto stole the show with his performance. He was the National Golden Gloves champion in 2015 and is trained by former amateur success Mickey Rosati in his trainer’s gym over his auto body shop in South Philadelphia. Carto’s brother Frank is an amateur and his father Frank recently said “Manny and Christian have sparred together many times”. Carto comes from a long line of boxers with two uncles and a grandfather who boxed. Hard Hitting Promotions has been promoting him since he turned professional in July of 2016. His next fight should be at the Tropicana Casino in Atlantic City, NJ, sometime in June. He is a boxer-puncher. The other “little big man” is super bantamweight Manny “Major Pain” Folly, 10-0 (8), out of Philadelphia who has served on the city Police force for the past three years. He trains out of the Rock Ministry Gym in the Kensington section of the city under owner, trainer and manager Buddy Osborn who also had a successful amateur career. In his last bout he stopped veteran Luis Hinojosa, 30-10, at the 2300 Arena in South Philadelphia. He too, usually is fighter of the night. Before turning professional in 2013 Folly was a Bronze Medalist in the National Golden Gloves. 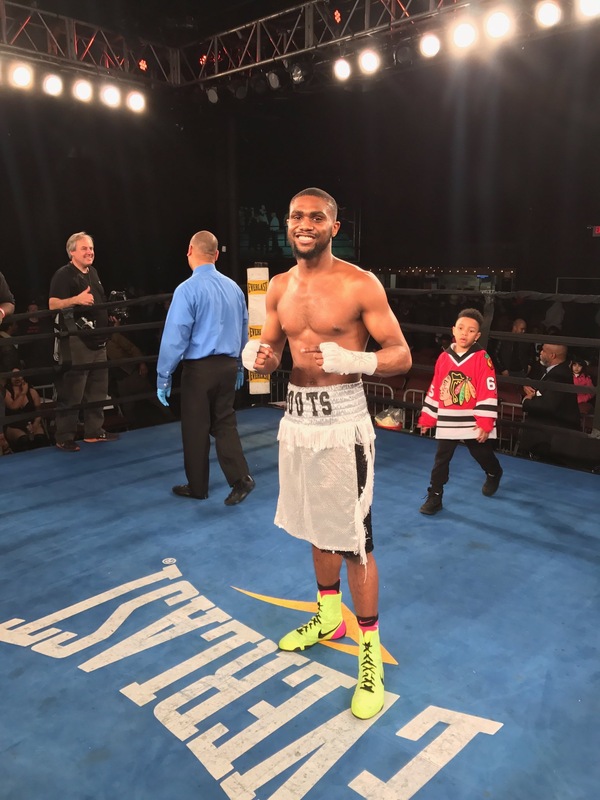 It’s been a lot more difficult for this 25 year-old since he has worked on swing shift to squeeze in a professional boxing career only averaging two fights a year. He reminds one of a “back-in-the Day” boxer with a Philadelphia style of boxer-puncher. Both Carto and Folly have a large following and with a combined record of 19-0 with 17 knockouts one would suspect a good following. Besides they are two of the nicest and respectful young boxers out of the city.So Philadelphia has not only one “big little man” but two. Keep your eye on both of them in the future!